Ms. Dolter has been coverage counsel for insurers in third and first party matters for over 25 years. She has significant experience as Monitoring Counsel for Bermuda, European, and US insurers, with emphasis on complex liability claims. 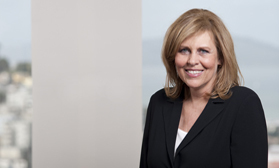 Ms. Dolter is a Special Counsel in Severson & Werson’s Insurance Practice Group. She advises domestic, European and Bermuda-based insurance companies and numerous syndicates at Lloyd’s, London on coverage and claim handling issues. She has over 25 years experience in analyzing and litigating first and third party coverage issues for insurers. Third party coverage matters handled by Ms. Dolter include those arising out of professional liability, product liability, mass torts, construction, environmental, aviation, defamation, employment, sexual misconduct and management liability/D&O disputes. Ms. Dolter’s practice includes monitoring high exposure litigation in California and other jurisdictions, including trial monitoring. She also serves as Monitoring Counsel for Underwriters at Lloyd’s on professional liability programs. In her spare time, Ms. Dolter enjoys going to professional golf tournaments and college basketball games.